When the days are getting colder and the first signs of snow are appearing in England, it may seem like a crazy time to be getting back into frozen Acai bowls, but I have found that these make a great change to the usual porridge, and are far more satisfying and sessionally appropriate than a fresh fruit smoothie! To keep this Winter version super nourishing I have gone to town with the rich nutty toppings to ensure it is full of healthy, filling fats. This also makes it extra convenient and easy to make; you can rely entirely on your stock cupboard and frozen ingredients as this recipe doesn't call for any fresh fruit! It really is the most simple 3 step process to make, and the ingredients are super versatile so can be changed up depending on what you have available at home. The key ingredients are frozen bananas and berries, anything else is just added extras! 1. Combine all the frozen fruit in your food processor and add ice as you go to get your desired texture. The texture should be similar to a sorbet, and notably thicker than a smoothie. Note: you really do need a food processor for this, if you use a blender you will need to add some form of liquid to blend and you will end up with a thinner more smoothie like texture! 2. Spoon out the frozen fruit mix into your bowl(s) and level out the top with a spoon so it is smooth and flat. 3. Lastly, add the toppings! Take your choice of dried fruits and nuts to add flavour, texture and bulk to the mix! To make it super filling and delicious nut butter is perfect, and it also adds a lovely creaminess to the texture. Coconut is perfect for sweetening so I added two versions, finely desiccated and the chunkier shavings. Banana chips would also be a delicious dried fruit to add! 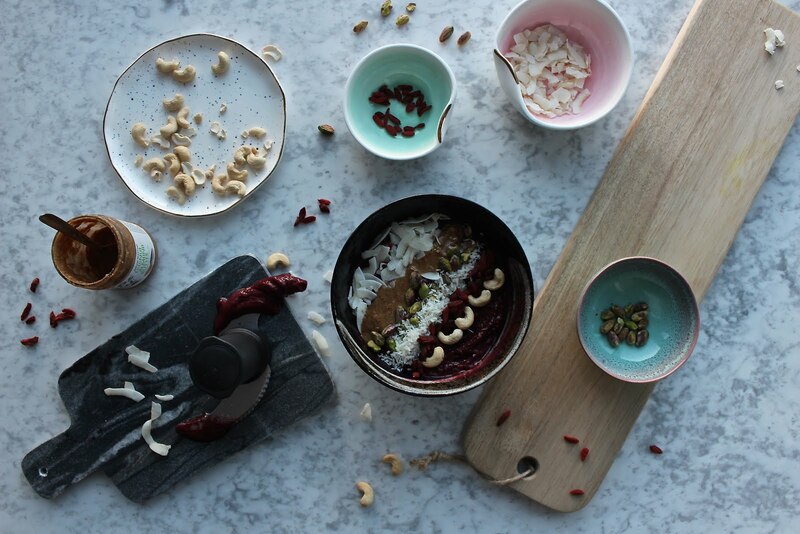 If you have a bit of etra time on your hands, and to make it super tasty you could also lightly toast the nuts or any seeds toppings in a pan, which would make them that extra bit delicious and warming!